A Beautiful Place to "Bee"
If the word "bee" was a verb, Colorado would be a very good place to "bee." The diversity of native bee species is high, with at least 946 species of bees in the state. This past month alone I have personally observed many interesting bees. 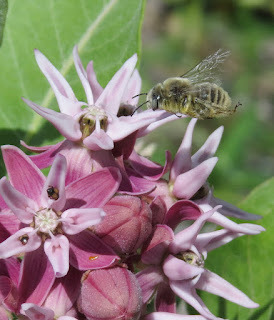 Male cactus bee, Diadasia enavata, approaching milkweed flowers Slowly, more people who are not scientists are learning that there are bees other than the Honey Bee and bumble bees. The overwhelming majority of our native North American bees are solitary, each female constructing her own nest as a burrow in the ground, a hollowed-out pithy twig, or a pre-existing cavity in wood, rock or masonry. A few mason bees make free-standing mud nests. 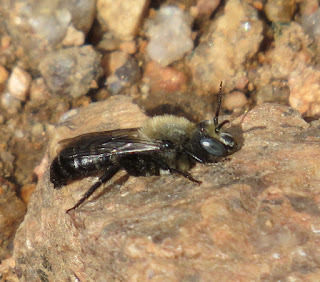 Some of the ground-nesting sweat bees express some degree of sociality, with daughters helping their mother raise a second generation of offspring. 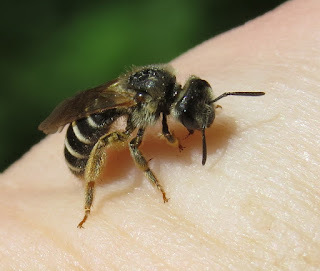 Male leafcutter bee, Hoplitis hypocrita Male bees often congregate in the neighborhood of places where females are nesting, creating the impression that they are social and "swarming." Male bees lack stingers, but to those unaware of that fact an active aggregation of flying males can be intimidating. My wife organized a group of naturalists to visit "Emerald Valley" on the back side of Cheyenne Mountain, beyond the reach of The Broadmoor resort camp, on June 29. A break from the mostly overcast and rainy weather we've been having allowed us to observe several species of bees. Even the trail itself provides bare earth that burrowing bees like to nest in. Male yellow-faced bee, Hylaeus basalis Most bees are difficult to identify from images alone, but I am fortunate to have colleagues like Hartmut Wisch, a naturalist in southern California, and John Ascher at the American Museum of Natural History, who are so familiar with native bees that they can make many species-specific identifications from images of live bees. 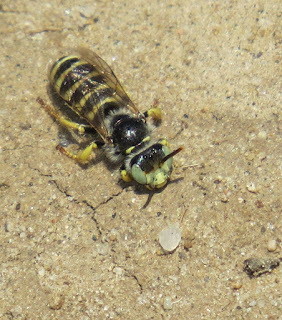 Hartmut helped me identify the surprisingly large male Hylaeus basalis from Emerald Valley; and John shocked me by identifying the bigger, hairy males on the trail as "plasterer bees" (aka "cellophane bees") in the genus Colletes. Females of both Colletes and Hylaeus coat the cells of their underground nests with glandular secretions that are organic polymers (plastic!). This keeps the pollen and nectar from spoiling as the larval bee eats it. Male plasterer bee, Colletes sp. Other higher-elevation species include leafcutter bees like the genus Hoplitis, some of which are metallic green or blue. Males drive each other off, and flirt with females, around logs with beetle borings where the females make nests. Sometimes, you are what attracts bees. I had the pleasure of entertaining a female "sweat bee," genus Halictus, as she sipped my perspiration during the Emerald Valley trip. Female sweat bee, Halictus sp. 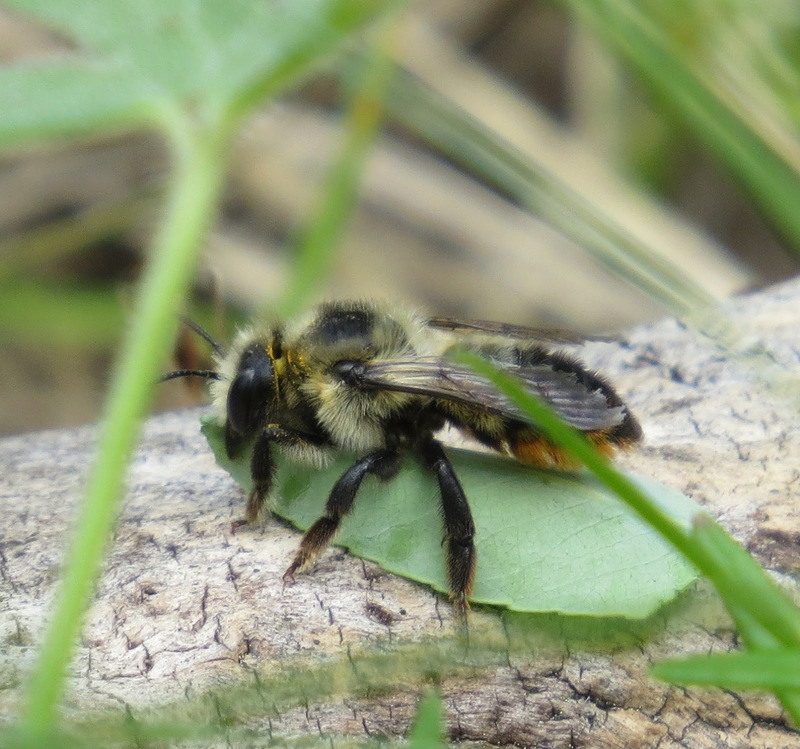 A trip to Lovell Gulch in Woodland Park, Colorado (Teller County, elevation over 8,000 ft.) on July 13 gave Heidi and I a treat in the form of a female Megachile melanophaea pausing with her burden of a piece of leaf she had just cut. Thanks to John Ascher and Étienne Normandin for making the identification. Leafcutter bees shear oval pieces from soft leaves or flower petals to fashion barrel-shaped cells they stack along the length of a pre-existing tunnel in wood, or a burrow in the soil. Perfectly round leaf pieces cap a finished barrel, which will contain a pollen-and-nectar ball and an egg. Female leafcutter bee, Megachile melanophaea Back down here on the plains, additional bees can be found. The sandy soil is a perfect substrate for ground-nesting bees like Calliopsis zebrata in the family Andrenidae. I was surprised by the size of the males of this species. Most Calliopsis are very small. Males fly relentlessly over places where females nest, landing ever so briefly now and then. Male mining bee, Calliopsis zebrata Flowers are, naturally, where you see most bees as they sip flower nectar and, if they are females, collect pollen. 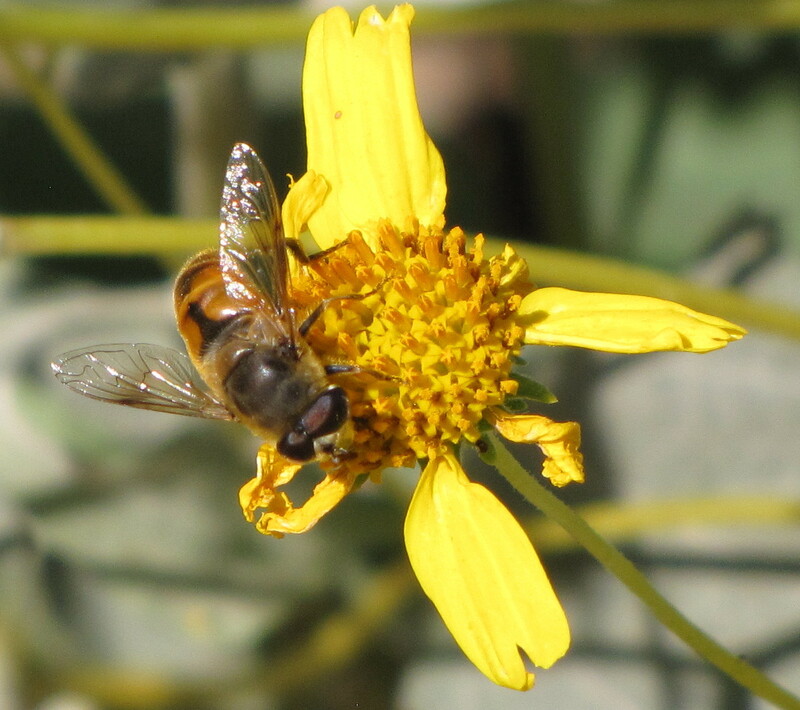 We are having an exceptionally wet year (wettest May on record for El Paso County), and while wildflowers have prospered, there appears to be a dearth of pollinators in terms of abundance, at least. Bees do have their enemies, and sometimes those enemies are other bees. 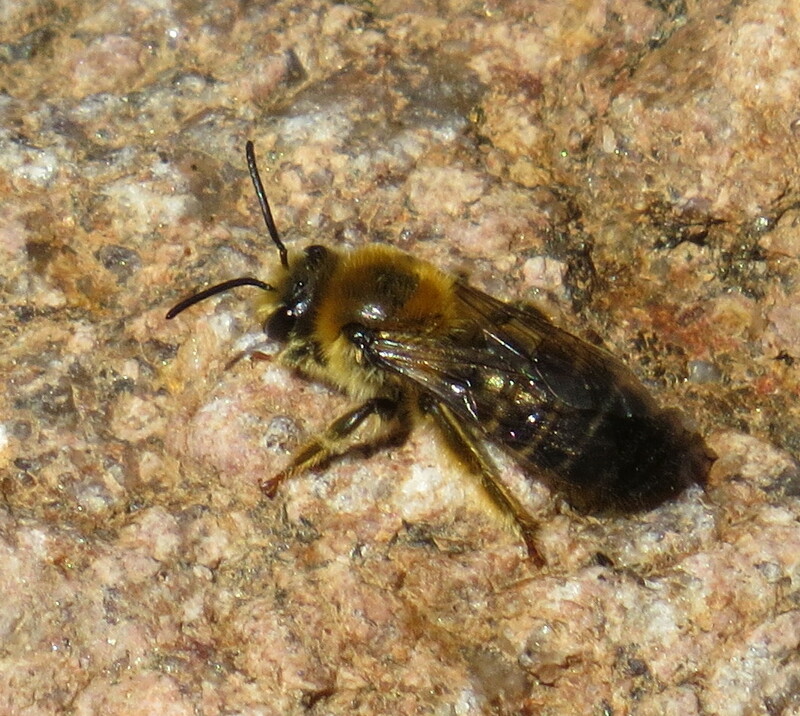 I was stumped by one particularly large, solitary bee I encountered on May 28 in Cheyenne Mountain State Park. The insect landed on the trail and stayed there, allowing me to approach close enough to take pictures. 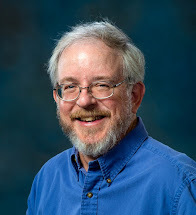 Doug Yanega of the University of California, Riverside, another top-notch bee expert, kindly provided the identification of Melecta pacifica fulvida. It turns out this species is a cleptoparasite of the digger bee Anthophora pacifica. The female Melecta enters the burrow of its host and lays an egg there. 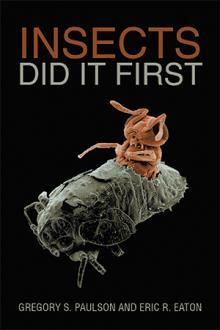 The larva that hatches then eats (steals) the pollen and nectar intended for the host's offspring. Female cuckoo bee, Melecta pacifica I do hope that if you don't live in Colorado, you will be able to visit and take in the rich diversity of flora and fauna here. I would be happy to go afield with you and introduce you to our "bee"-autiful flora and fauna. Source: Scott, Virginia, John S. Ascher, Terry Griswold, and César R. Nufio. 2011. The Bees of Colorado. Natural History Inventory of Colorado No. 23. 112 pp. (PDF version)..
Last week I wrote about a mason wasp that successfully captured a leaf-rolling caterpillar. Amazingly, the day after I made that observation, I saw another species of mason wasp hunting a slightly different kind of caterpillar. This time it was a female Ancistrocerus campestris attempting of fish out a leaf-tier caterpillar (genus Psilocorsis, family Amphisbatidae) from its shelter between two lashed-together oak leaves. The drama unfolded at Tully Lake, between Athol and Royalston in north-central Massachusetts, by the boat launch. 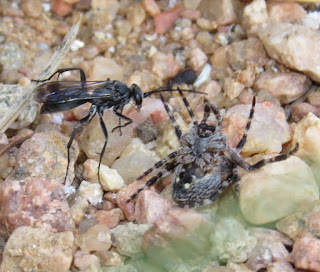 I happened to notice the same schizophrenic behavior in this wasp that I had observed in the female Ancistrocerus unifasciatus female the previous day. I turned on the video feature of my camera a number of times, for long durations, but this wasp's attempts were ultimately unsuccessful. 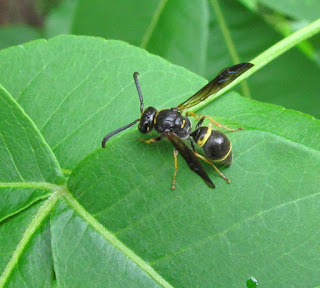 Leaf-tiers, in contrast to leaf rollers, can involve more than one leaf, creating a "sandwich" like the one the wasp is exploring in the images and video here. I concluded, given the host plant (oak), that this was likely the work of a caterpillar in the genus Psilocorsis in the family Amphisbatidae. That information also helped me in my assessment of the wasp's identity. 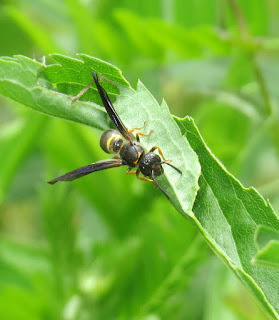 Ancistrocerus campestris is of average size for a mason wasp. The forewing length of females ranges from 9-11 millimeters, and 6.5-9 mm for males. The color pattern on the abdomen is fairly consistent, the hind margins of the first three abdominal segments colored in yellow. The genus Ancistrocerus can be identified by a transverse ridge along the front surface of the first abdominal segment, creating an abrupt angle and "face" that faces the rear of the thorax. In other genera the abdomen slopes more gently toward the thorax. This time, the wasp did try to tear into the leaf shelter, evidenced by the holes she chewed in the surface of the top leaf. The brown patch is likely the result of the caterpillar feeding on the bottom surface of that top leaf. The wasp also ran around the entire edge of the shelter, trying to wiggle inside and grab the occupant. Had she succeeded, she would have flown her prize to her nest, inside a pre-existing beetle boring in wood, a hollowed-out sumac twig, or an abandoned mud dauber nest. She divides such tunnels into cells, after completing a single cell by laying an egg and then caching several paralyzed caterpillars. She uses mud to make partitions between cells, and for the plug that closes a finished nest. A nest may contain anywhere between two and eleven individual cells. This wasp has, on one occasion, been seen taking over active nests of the keyhole wasp Trypoxylon clarkei, kicking out the rightful owner. Besides caterpillars in the family Amphisbatidae, this mason wasp uses caterpillars from the family Gelechiidae ("twirler moths"). Nests can be invaded by parasites including the bee fly Toxophora amphitea, and the tiny eulophid wasp Melittobia chalybii. Grubs of the wedge-shaped beetle Macrosiagon cruentum may prey on the wasp larvae. Ancistrocerus campestris can be found from southern Ontario, Canada through New England south to Florida, and west to Minnesota, South Dakota, Kansas, and Texas. Look for this species along forest edges in woodland habitats. Sources: Buck, M., Marshall, S.A. and Cheung D.K.B. 2008. "Identification Atlas of the Vespidae (Hymenoptera, Aculeata) of the northeastern Nearctic region," Canadian Journal of Arthropod Identification No. 5: 492 pp. (PDF version). Eiseman, Charley and Noah Charney. 2010. Tracks & Signs of Insects and Other Invertebrates. Mechanicsburg, Pennslvania: Stockpole Books. 582 pp. Krombein, Karl V., Paul D. Hurd, Jr., David R. Smith, and B.D. Burks. 1979. Catalog of Hymenoptera in America North of Mexico Volume 2. Washington, DC: Smithsonian Institution Press. pp. 1199-2209. Krombein, Karl V. 1967. Trap-nesting Wasps and Bees: Life Histories, Nests, and Associates. Washington, DC: Smithsonian Press. 570 pp. 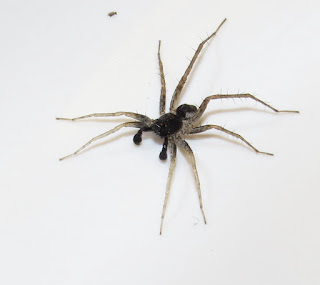 Most people think of wolf spiders as big, hairy monsters just this side of a tarantula in size. A few species are, but the overwhelming majority are mid-size or even downright "compact." 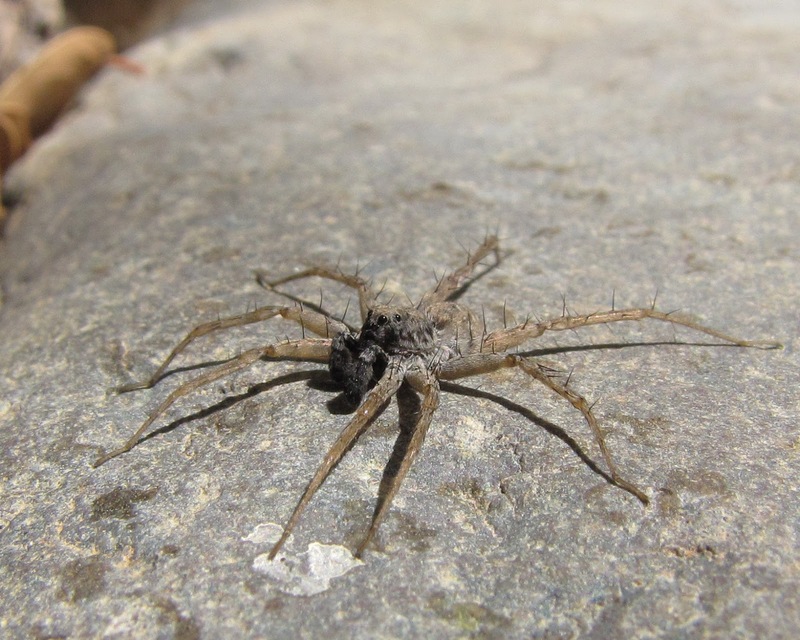 Case in point, the most overwhelmingly abundant wolf spiders you are likely to encounter are in the genus Pardosa, the "thin-legged wolf spiders." They are mostly small and medium-sized. 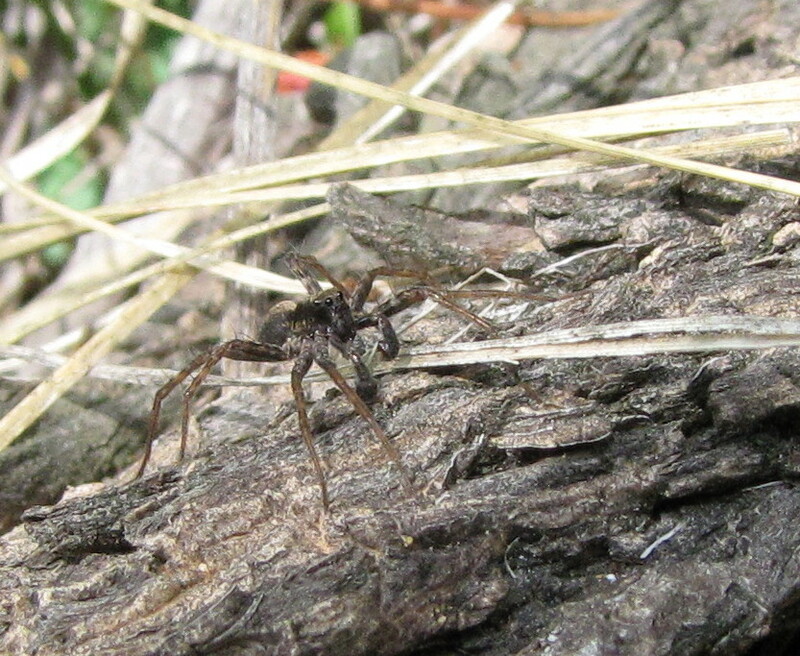 Wolf spiders in general are rather easily identified by their eye arrangement. Four small eyes are in the front row, lowermost on the face: the anterior medians (center pair), and anterior laterals (one on each side of the anterior medians). The next row is composed of two enormous eyes, the posterior medians. Last in line is one pair of posterior laterals, usually well back on the carapace from the other sets of eyes. How does one identify Pardosa in particular? Look at the legs. 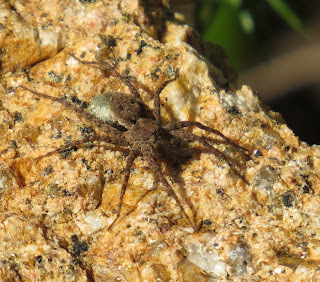 Pardosa has long spines that are almost perpendicular to the axis of the leg itself. Most all other wolf spiders have shorter spines that are more nearly parallel to the surface of the leg. The hind pair of legs is long, and it is often easier to see the spines on that rear pair. 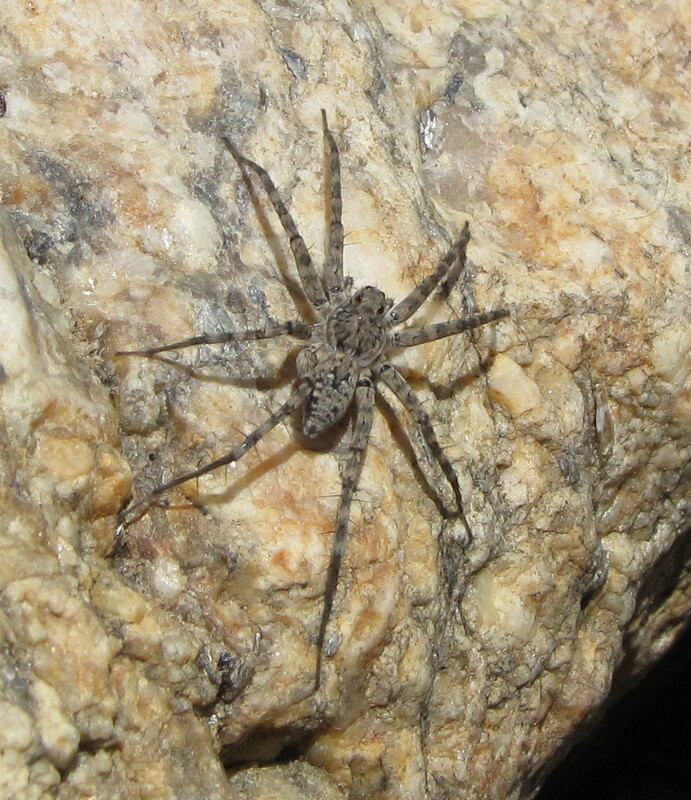 Thin-legged wolf spiders often exhibit some degree of sexual dimorphism, too. Mature males may have a completely different color pattern from females. Identification of species hinges on microscopic examination of the genitalia. Females have a paired genital opening called an epigynum. Males have highly modified pedipalps they use to deposit sperm into the epigynum, like a key fitting in a lock. The pedipalps of a mature male spider resemble little boxing gloves near his face. There are sixty-five (65) species of Pardosa currently recognized in the U.S., and 75 species north of Mexico if you include Canada. They collectively measure 3 to 12 mm or so in body length as adults. 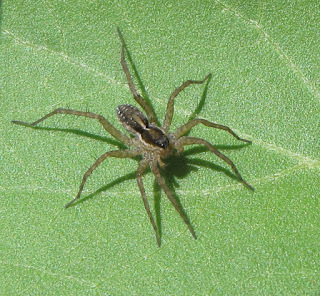 The cephalothorax is higher than in most other wolf spiders, and the sides of the face are nearly vertical. 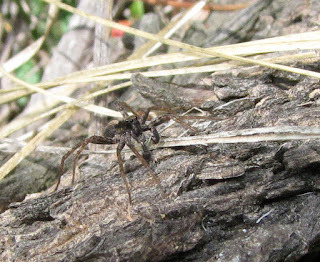 Thin-legged wolf spiders are perhaps most abundant around water, be it a rocky streambed, or marshy wetland, or beach around a lake. They can also be found in wooded areas, prowling the forest floor, scrambling over logs, or darting among leaf litter. Fields are full of them, too, even the edges of agricultural plots. They also occupy some of the highest elevations of any North American spiders, so look for them in the mountains, too. 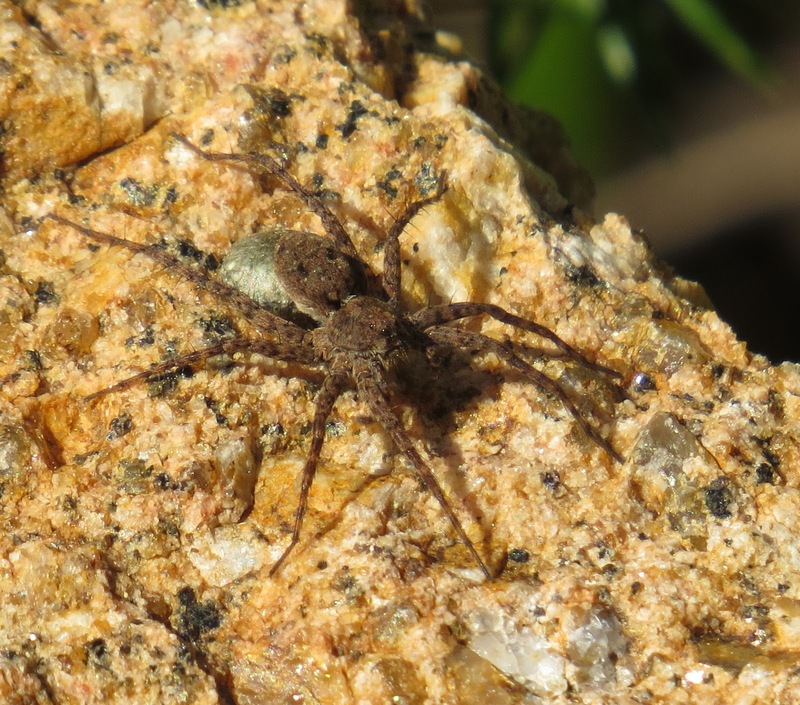 It is interesting that some species can be found in several different habitats, whereas most spiders are confined to one or two (as are several Pardosa species). In short, it is difficult to not find these spiders. Vogel, Beatrice R. 2004. "A Review of the Spider Genera Pardosa and Acantholycosa (Araneae, Lycosidae) of the 48 Contiguous United States," J. Arachnol. 32: 55-108. I recently started working part-time at Songbird Supplies, LLC, located inside Summerland Gardens here in Colorado Springs. One of the perks has been encountering insects I seldom see. 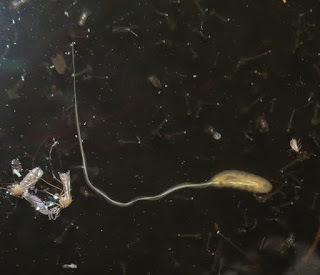 Julie, the proprietor of Summerland Gardens, called me over the other day to help her identify a "primordial soup" bug in one of the water gardens she is cultivating. 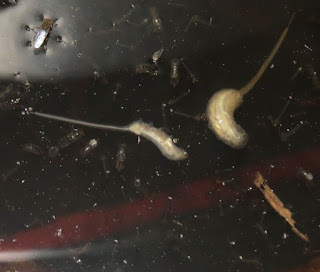 I was surprised and delighted to find the critters in question were "rat-tailed maggots," the larvae of flower flies in the tribes Eristalini and Sericomyiini (subfamily Eristalinae, family Syrphidae). I had seen them maybe one other time previously. The conundrum faced by folks with water container gardens is this: do I put in "mosquito dunks" to kill the mosquito larvae, or do I refrain so that the syrphid larvae can grow up into pollinator-capable adult flies? There is no right or wrong answer. Syrphid flies are definitely not endangered species, so I might deploy the dunks. 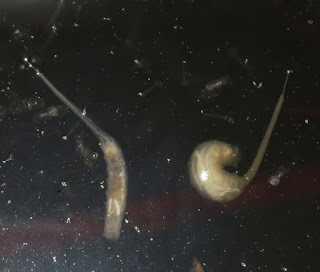 The rat-tailed maggots are named for the posterior spiracles, which are fused into an extensible breathing siphon that connects them to the water surface at all times. Meanwhile, at the other end, they are filtering bacteria and other microbes from organic matter in the water. 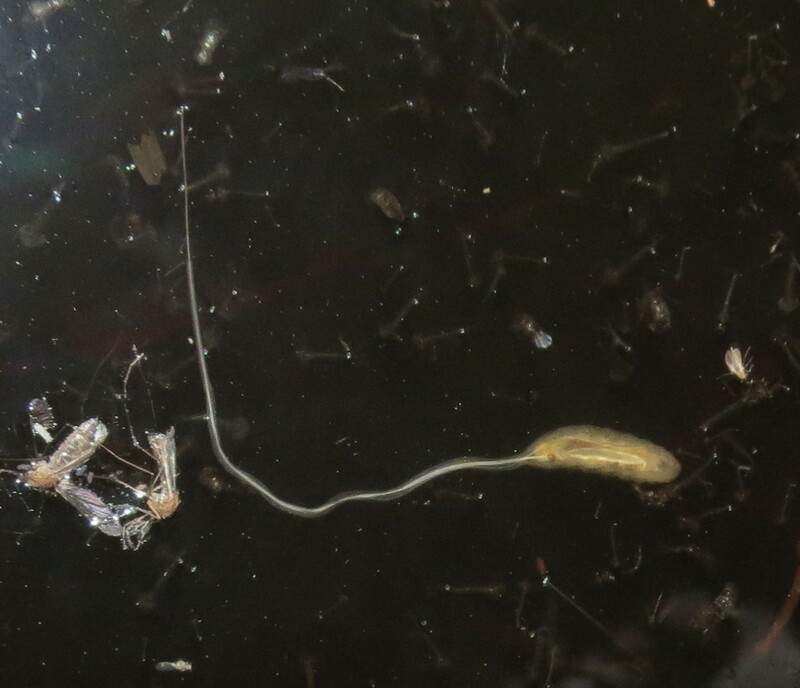 Larvae of some species exist in rather dense material like saturated manure, which barely qualifies as aquatic, but is too wet for other dung-eating fly larvae. 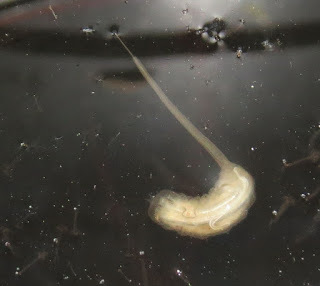 The low oxygen levels in this kind of substrate are no problem because the maggot's spiracles are always connected to the surface. The length of the "snorkel" varies greatly depending on the genus of flies. Eristalis larvae have very long tubes, as shown in the images here; Chrysogaster falls at the other end of the spectrum, with quite a short siphon. Different genera occupy different aquatic niches. Mallota and Mylopeta, for example, live in the water that collects in tree holes. Sericomyia larvae live mostly in bog mat pools. Chrysogaster thrive along the edges of ponds and among emergent vegetation. The most commonly-encountered species are probably in the general Eristalis, Eristalinus, Helophilus, and Palpada, since they are most likely to be seen in urban, suburban, and rural areas. They live in putrid and organic-rich standing water. I know they are sometimes found while cleaning rain gutters. Once the larva reaches maturity, it seeks dry land on which to pupate. Teh pupal capsule is hard, and resembles a tiny mouse in shape. 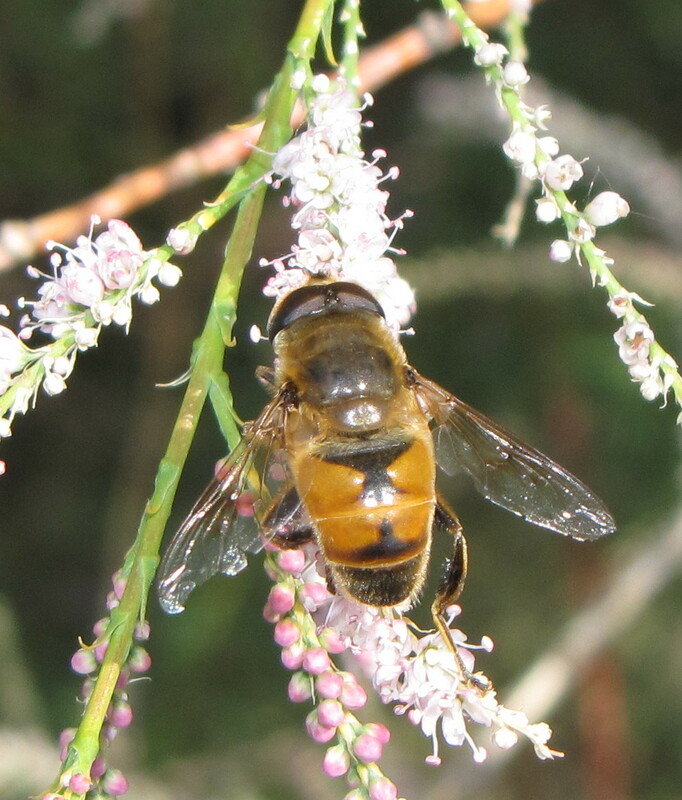 The "Drone Fly," Eristalis tenax, is the most common adult version of a rat-tailed maggot that one is likely to see. It is a stunning mimic of the honey bee. Likely introduced ages ago from Europe, it is now an established and widespread species across the entire North American continent. It is also a fairly respectable pollinator, visiting wildflowers, and the blossoms of orchard trees and landscape plants. Here is an interesting piece of trivia: It is speculated that it was rat-tailed maggots that gave rise to the biblical account of "bees" spontaneously appearing from the rotting carcasses of animals. Certainly, the fluid decomposing material in a corpse would be a perfectly acceptable habitat for Drone Fly larvae. Sources: Carr, John F. 2013. "Rat-tailed Maggots," Bugguide.net. McAlpine, J.F. (editor). 1987. Manual of Nearctic Diptera Volume 2. Ottawa: Agriculture Canada. Monograph No. 28. pp. 675-1332. Merritt, Richard W. and Kenneth W. Cummins. 1978. 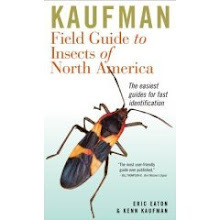 An Introduction to the Aquatic Insects of North America. Dubuque, Iowa: Kendall/Hunt Publishing Company. 441 pp. Pfiester, Margaret, and Phillip E. Kaufman. 2009. "Rat-tailed Maggot," Featured Creatures. University of Florida Department of Entomology and Nematology. 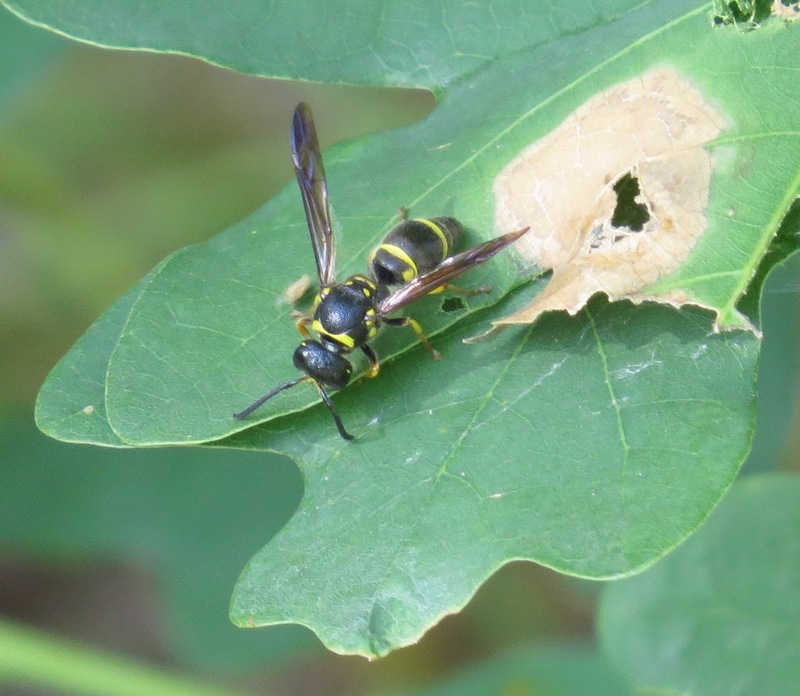 Solitary wasps are amazing creatures, and their hunting behavior is particularly interesting. 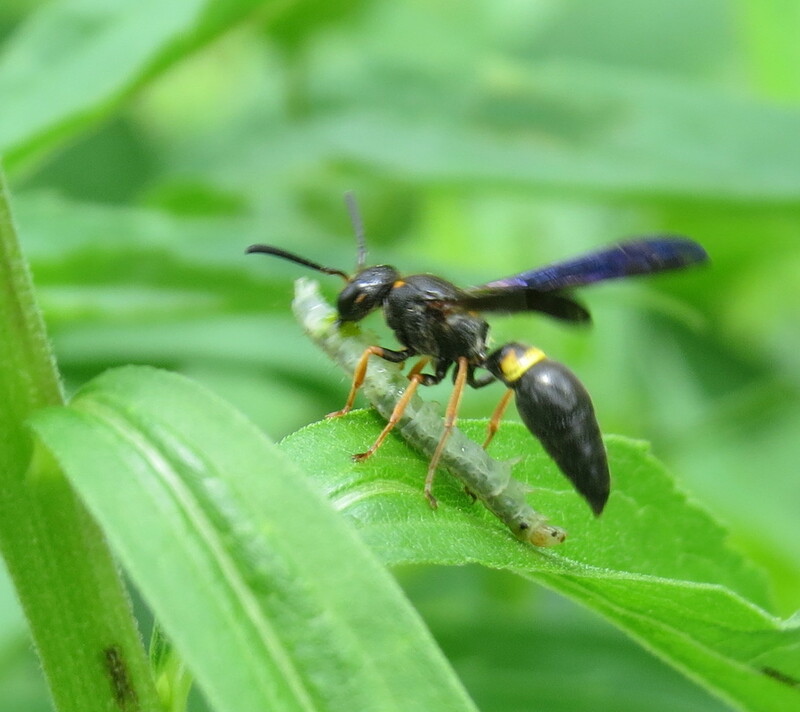 While my wife and I were in western Massachusetts last month, I was privileged to witness a female mason wasp, Ancistrocerus unifasciatus, successfully capture a leafroller caterpillar. I also got parts of the drama on video. The scene: A large suburban residential backyard in Athol, Massachusetts, specifically planted to attract all manner of pollinating insects. Natural habitat is mixed hardwood and conifer forest, that abuts the property where this episode took place. Western Massachusetts is an odd mix of suburban and rural, actually, and it is difficult not to characterize this particular property as a "farm." 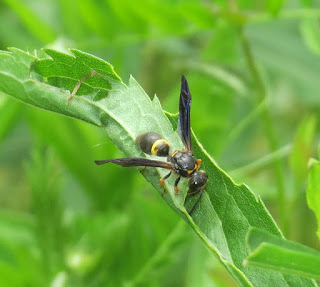 The leading actress: Ancistrocerus unifasciatus is a mid-sized mason wasp in the family Vespidae, subfamily Eumeninae. Females have a forewing length of 9.5-12 millimeters, males a forewing length of 6.5-9 mm. Both genders are basically deep brown or black with few yellow markings on the face, antennae, base of the abdomen, and legs. Males have a large yellow patch on the face, females a couple of spots. Only females do hunting and nest building. The species ranges throughout the eastern U.S. west to Iowa, Kansas, and Texas. It also occurs in southern Ontario and Quebec, and Prince Edward Island. The victim: I honestly cannot verify the identity of the caterpillar in this case, but it is certainly a leafroller in the moth family Tortricidae, and *possibly* the species Archips purpurana, which has goldenrod as a known host plant (among several others). Is it coming out yet? The wasp did not pursue its prey the way I thought she would. It even took me a minute to ascertain that she was hunting. I figured she would simply tear open the rolled leaf, grab the caterpillar, and go. Apparently the silk-bound fortress is more impregnable than I imagined. What the wasp did instead was pure genius. She took advantage of the caterpillar's instinct to "eject" when it feels like its home will be compromised. The wasp ran to one end of the leaf roll, then walked back, vibrating her abdomen to entice the moth larva to jetison itself. Back and forth she ran, as this video shows. 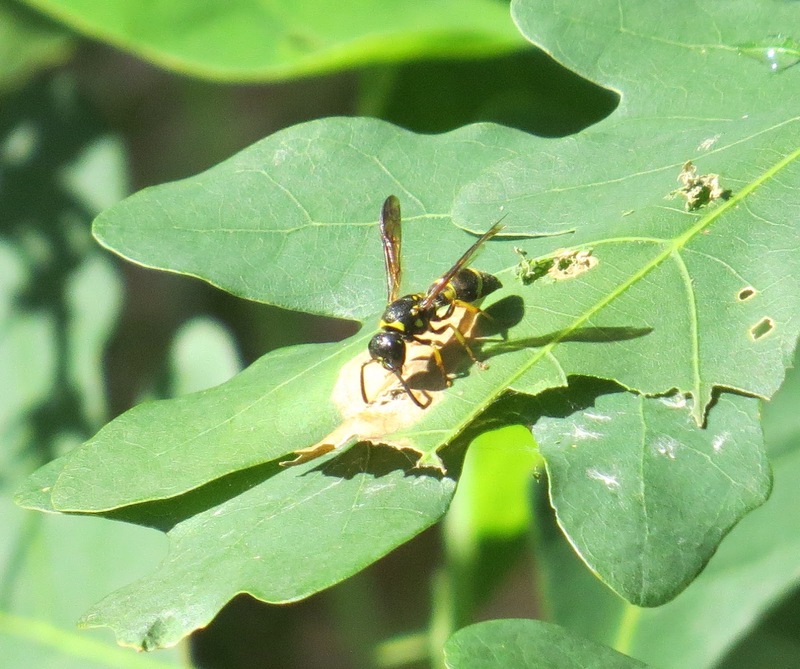 Unfortunately, I did not keep the camera running through the entirety of the hunt, partly due to fatigue, but when I saw the wasp suddenly had the caterpillar in her jaws, I resumed the video in time to see her fly to a nearby leaf to finish stinging her prey into paralysis. Normally, the caterpillar, if threatened, takes a flying leap out of the leaf roll, trailing a silken line that it will then use to climb back once danger has passed. Kind of the caterpillar version of bungy jumping. The wasp obviously exploits this tendency, and very effectively. So, what does the wasp do with the caterpillar? Where does she take it? 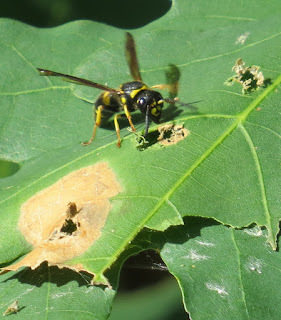 Adult wasps typically feed on flower nectar, aphid waste ("honeydew"), fermenting tree sap, and/or other liquids high in carbohydrates to fuel their energetic activities, like flying. So, this morsel of protein is not something the wasp would eat. The caterpillar is instead intended for her larval offspring. Ancistrocerus unifasciatus likes to set up house in abandoned mud dauber nests, especially those of Sceliphron caementarium and Trypoxylon politum. 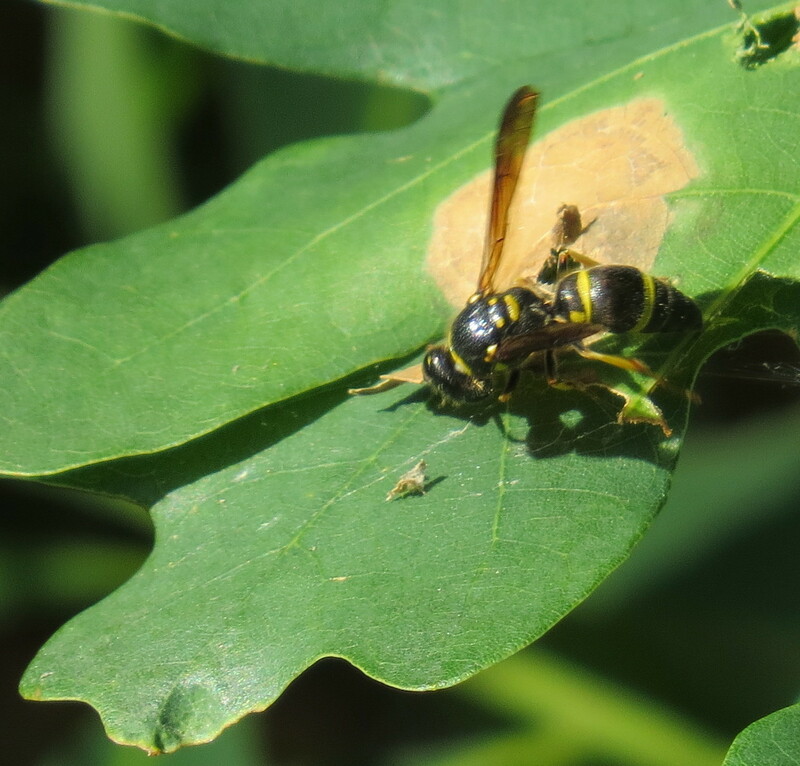 The mason wasp caches several paralyzed caterpillars in one of those cells. She lays an egg in the cell, then erects a partition and begins filling another cell along the length of the original, larger cell made by the mud dauber. The larval wasp that hatches then has a larder of fresh food to feed it. Eventually it spins a silken cocoon, and pupates inside. An adult wasp emerges weeks later and chews through the mud wall to freedom. Krombein, Karl V., Paul D. Hurd, Jr., David R. Smith, and B.D. Burks. 1979. Catalog of Hymenoptera in America North of Mexico Vol. 2. Washington, DC: Smithsonian Institution Press. 2209 pp. I am finally remembering to shoot video of interesting insect behavior when I'm presented with the opportunity. Please do not come to expect movies and clips as a regular part of this blog, but know that I am trying to get that kind of documentation. 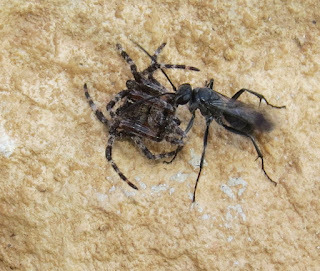 For example, I recently happened upon a female spider wasp, which I later identified as Agenioideus humilis, dragging an unidentified, comatose orbweaver down the rockwork on the exterior of an outbuilding in North Cheyenne Cañon park here in Colorado Springs, on June 27. 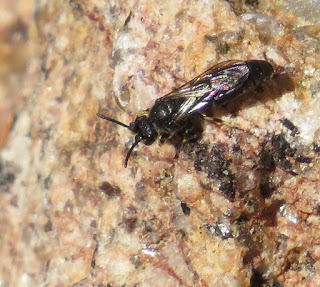 This is a small wasp, females ranging from 5.5-10.5 millimeters in body length (8 mm average), males even more diminutive at 4-9.5 millimeters (6.5 mm average). Both genders are dull black, with a dorsal white spot near the base of the tibia ("shin" segment) on the hind leg. The wings are clear, but with a dark edge and broad dark band on the front wing. Agenioideus humilis ranges across the entire U.S. save for the northern Rockies, northern Great Plains, most of Minnesota, Wisconsin, and northern Michigan. Nowhere does it appear that this species is common, and it is scarce in collections. The wasp does not appear to feed on flower nectar or aphid honeydew, the favorite foods of most adult spider wasps in the family Pompilidae. I almost missed seeing this female completely, as she had ducked behind a drainpipe running vertically down the building. The shadow cast by her and her prey is actually what caught my attention. Despite being startled by my approach, she maintained a grip on her spider victim and continued here zig-zag descent down the wall, as reflected in the video clip below. Once she reached the ground, she deposited her burden and commenced grooming herself briefly. She then ran about a foot away, to the base of the building, where it appeared she had already started a nest burrow. This next clip shows her digging at warp speed, sand flying between her legs and behind her. Prior records for this species show it will also nest in pre-existing cavities such as cracks and crevices in rocks or the walls of buildings. The single victim is paralyzed by the wasp's sting and hauled to a suitable location for....burial. 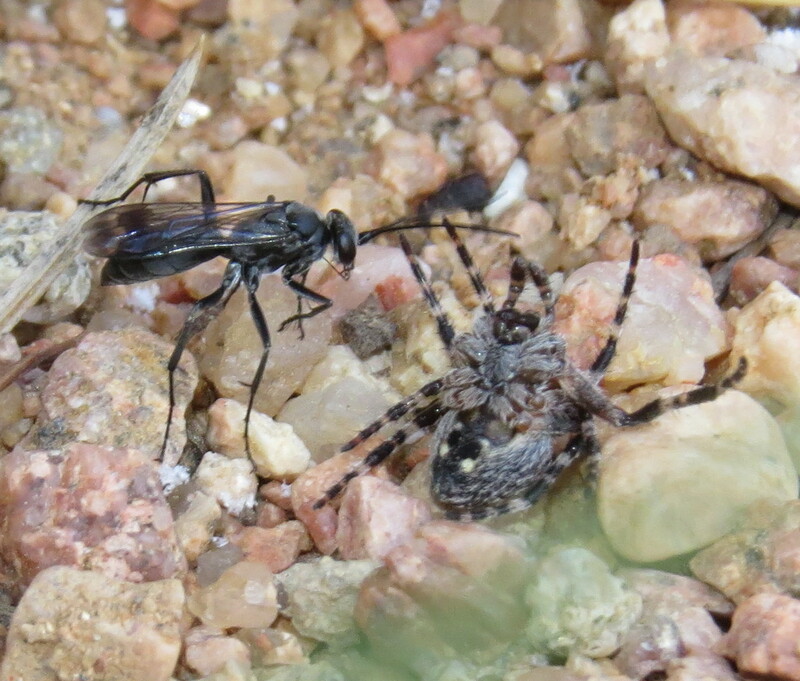 The wasp lays a single egg on the spider, then covers her tracks by scraping soil over the nest entrance and compacting it with blows from her abdomen. She then departs to begin the process again. While this wasp was actively engaged in nesting, another wasp lurked nearby, on the wall of the building. Initially, I thought this was some kind of parasitic wasp, but upon closer examination, it turned out to be a male of her own kind. He was substantially smaller and of considerably different body type than the female. 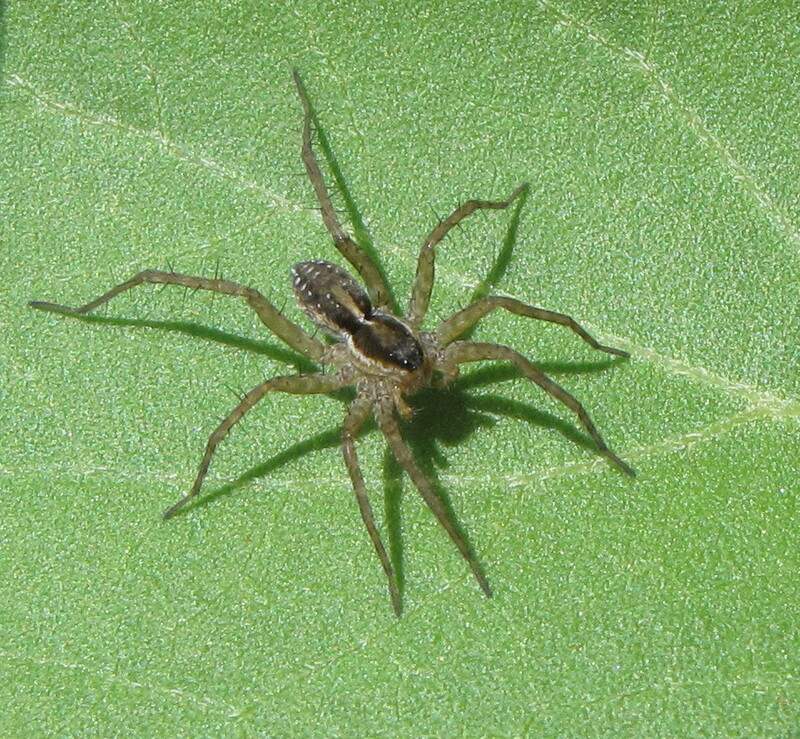 Prey records for Agenioideus humilis reflect that the preferred prey are orbweavers in the family Araneidae, with several different species represented: Acacesia hamata, Larinioides cornutus, and Araneus pegnia among them. 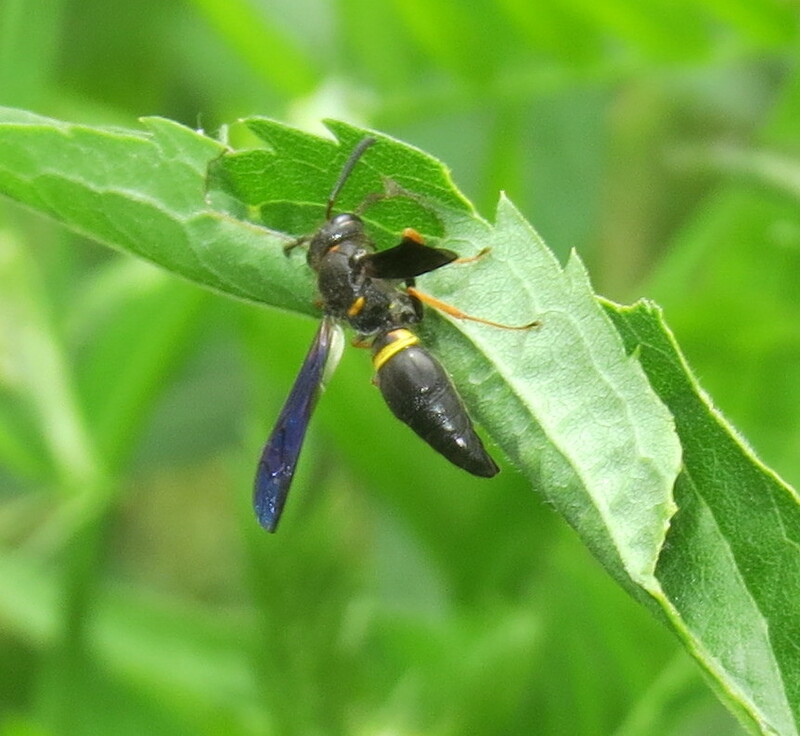 This spider wasp apparently favors woodland habitats with sandy soil, and indeed the landscape where I encountered this one was a mixed conifer (mostly pine) forest with Gambel's Oak, chokecherry, and other shrubs in the understory. I rarely find wasps toting prey, but I hope the next time that I do I will have means to record the event. 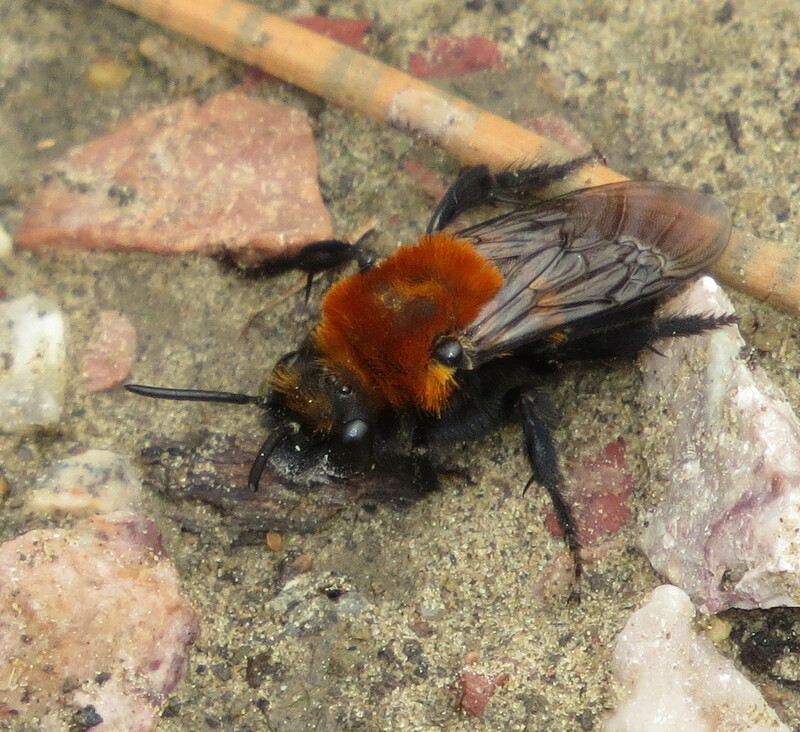 Keep your own camera handy, you never known when you will happen upon entomological drama. Wasbauer, M.S. and L.S. Kimsey. 1985. 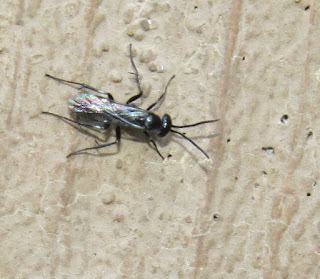 "California Spider Wasps of the Subfamily Pompilinae (Hymenoptera: Pompilidae)," Bull. Calif. Insect Survey. Vol. 26. 130 pp.